Echinoderms include familiar forms such as sea stars (or starfish), sea urchins, and sand dollars. 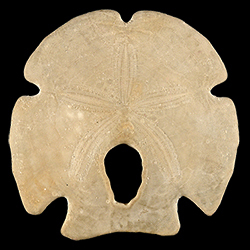 Much of the Neogene fossil record of echinoderms in the southeastern United States consists of the remains of sea urchins and sand dollars, which are known as echinoids. Because echinoids have robust exoskeletons made out of calcium carbonate and spend much of their time buried in the sand, they have a very good fossil record.